The applications with boards Grenamat AL - protection of sheet A/C piping and self-carrying A/C piping - were certified on basic of tests realised acc. ČSN EN 1366-1. 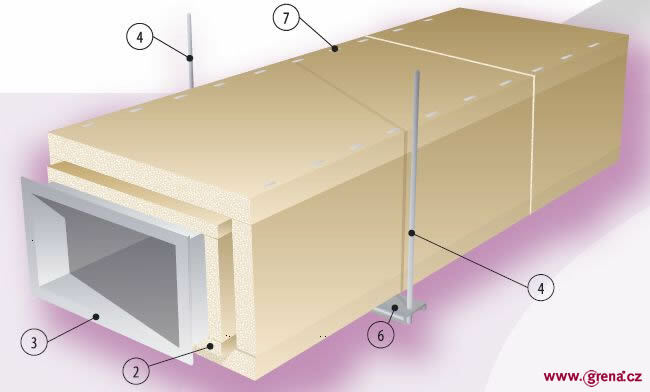 In the case of a typical duct, bilateral, trilateral, larger dimensions, please contact our specialists for fire-resistant and non-combustible Grenamat boards. 6. Load-carrying profiles "U", "L", "omega"
Determined thickness for required fire resistance are the same both for plating of sheet A/C piping, or for self-carrying A/C piping. All stated parameters are the same both for supposed fire inside the A/C piping, and for supposed fire from outside of the A/C piping. If you require only one parameter (a fire inside or outside), please contact our specialists for specify thickness of material. All values apply both for vertical and horizontal A/C piping. For vertical piping the values apply for a number of floors, if the distance between the supporting structures does not exceed the 5m. 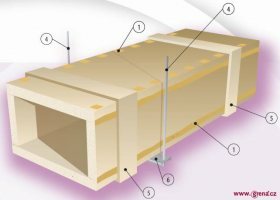 The self-carrying A/C piping features seams covered by glue Grena Klebepaste and covered by plates from boards Grenamat AL, thickness 10 mm, width 100mm. The plating of sheet piping does not require the seam gluing; the internal covering of seams is made by distance washers. Load-carrying profiles at distance of max. 1250 mm; fixing of hinging rod max. 50 mm from plating side. The dimension of load-carrying profiles of "U", "L" or "omega" is determined acc. t static calculation. The thickness of distance	washers inserted between the actual sheet piping and plating from boards Grenamat AL is determined acc. to height of sheet joint flange. The washer thickness is >= flange height. Based on your requirement we are able to calculate the dimension of the carrying profiles. Do not also hesitate to ask for a price quotation of these profiles, we supply several companies.